This tiny book contains a wealth of helpful hints for weight control. As I’ve journeyed through the struggles of weight loss and am hanging tenaciously to maintenance, I’ve picked up some of my favorite reads to peruse again for support and encouragement. 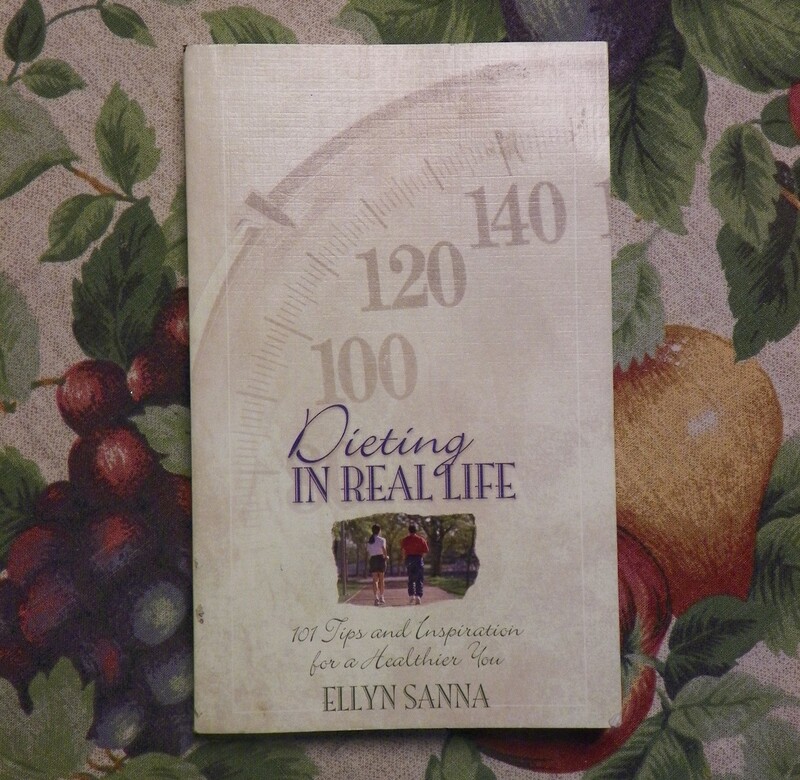 Found in a local thrift story, “Dieting in Real Life: 101 Tips and Inspiration for a Healthier You”, by Ellen Sanna, quickly came one of my prime resources. I kept it by my bed, so I could read one or two of the author’s 101 tips daily. The book, about the size of my hand, contains much wisdom and knowledge (both spiritual and secular) condensed into quick-to-read topics. It is divided into five sections: Changing our attitudes, Changing our eating habits, Curbing our desires, Spending more calories, Dieting and our emotions. If you are interested in purchasing this book, which was written in 2003, you’ll probably have to check some place like eBay or Amazon. However, it’ll be well worth the effort to track down! If you want to receives updates from Slimvictory, you can subscribe at the top of my page. Your comments are encouraged and appreciated! A bowl of steaming oatmeal with a fresh-cut orange and a side of cinnamon toast, eaten leisurely with a couple of mugs of coffee is my choice of a day-starter. However, many people probably consider a “day-starter” the time their ignition keys make their car engine turn over. And often, we don’t take time to eat. Yes, we all know how important a good breakfast is. The word comes from “break the fast”, which is exactly what the morning meal does. We may have not eaten for close to twelve hours, our physical engine is running on empty, and our metabolism is definitely stalling out. Fuel is needed, but the morning time-crunch can prevent that from happening. It’s so easy to grab a sugary treat as we breeze through the local fast-food joint, or run in the gas station. A fuzzy brain and some hunger pangs about 10:00 a.m. will probably be the results of this choice. However, a little pre-planning at the grocery store can help us fuel up and get our metabolism revving. A protein/carb duo is a wise morning choice, but in lieu of scrambled eggs and a whole-wheat muffin, the pictured breakfast can hold you in good stead. 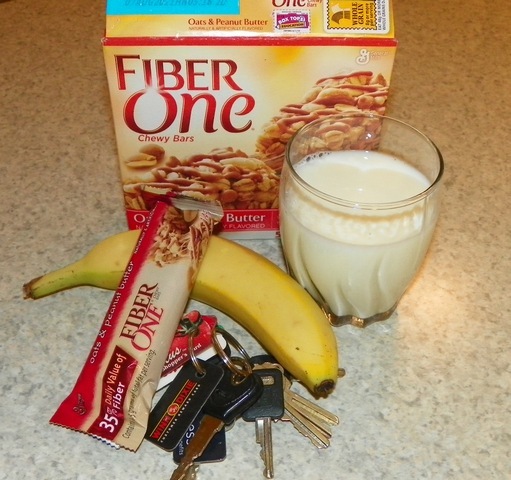 The Fiber One Chewy Bar provides a whopping portion of fiber to keep you satisfied (with only a few grams of sugar), the “pre-packaged, ready-to-eat” banana is easy to consume and provides additional fiber, and a cup of milk (skim or 1%) provides needed calcium and also a chug-a-lug of protein. So in this quick “meal” (which you could grab-and-go, and consume in five minutes before entering your workplace), you have good portions of healthy carbs, fiber, protein and calcium, all for about 325 calories. The fruit and milk are a healthy given, and there are many choices of breakfast-type bars on the market. Careful label-reading is advised, though, as some are loaded with sugar. All in favor of a quick, healthy breakfast, raise your keys! All calories are not created equal! Consider the pictured packet of dressing: it contains 250 calories of delicious creaminess to enhance a sizeable salad. Now let’s say you’re looking for a quick lunch, and you stop in your workplace cafeteria, pick up a greens-based salad and a pack of dressing, and chow down. As tasty as it will be, how many hours of hunger-relief are you going to get? By mid-afternoon or earlier, will your stomach be rumbling, sending you down the hall to peruse the vending-machine offerings? Probably so. But consider the other food choices in the photo. 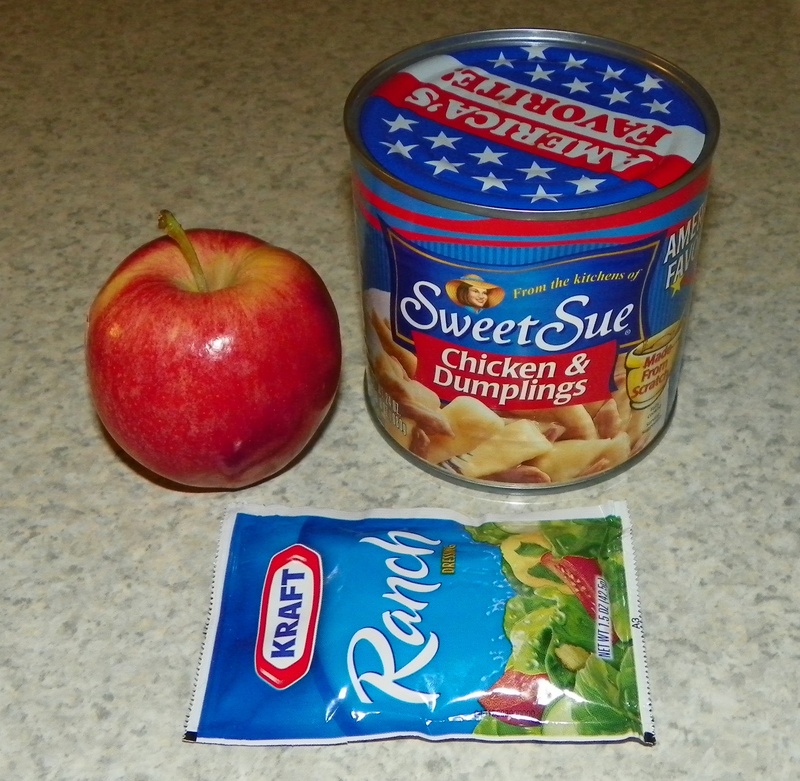 A cup of this hearty chicken-and-dumplings and a medium-sized apple would “weigh-in” at about the same calories. (Now, I’m not talking about the glycemic index here, only a calorie-comparable, filling meal, and one that could be conveniently brought from home and quickly-nuked.) This would likely keep many of us with an average appetite satisfied longer, especially if we had a substantial breakfast, which is always a good idea. Let’s take it a step further. When figuring your daily food-intake “budget”, suppose you want to stay around the 1400-calorie range. Many restaurant meals (often just an entrée) will come close to or exceed that number. Since most of us get hungry at least three times a day, if we choose to indulge in one of these mega-calorie meals, we have two choices: stay hungry or exceed our goal-intake. Spending a little time learning calorie counts of your commonly-consumed foods/meals can help you get more bang for your calorie-buck! Here’s a great family idea that is free, educational and healthy: next time you’re in Wally-World or your favorite grocery story, give everybody in the family a small notebook and let them do some perusing of nutrition labels. There is an incredible wealth of info there for those interested in cutting calories or just eating healthier. Since 3500 calories equal a pound, shaving 250 calories off your daily intake and combining that with 30 to 45 minutes of heart-pumping physical activity for the other 250 calories can result in a one-pound loss weekly. *Honey Nut Cheerios® has 110 calories in ¾ cup, whereas a full cup of plain Cheerios® has only 100 calories. *A king-size Payday® candy bar, which would seem like a “serving”, is actually considered two servings – the whole bar is a whopping 440 calories! *One cup of prepared mac and cheese offers 410 calories. *Ranch dressing is 140 calories and 14 fat grams for a “serving”, which is two tablespoons, but two teaspoons is probably plenty, for a savings of about 98 calories. Of course one can cut the calories almost in half by using Italian dressing instead – it’s 80 calories for the two tablespoon serving…use only one–third that and the count is negligible. And lower fat varieties will save more calories if a person wants to go that route. *100% whole-wheat bread is better for us than plain white bread, but even there, brands vary. Standard-size slices in one loaf may have 50 calories each, and another may be 110. *Some 20-ounce soft drinks contain around 240 calories. Drinking two a day will pack 50 pounds on a person’s frame in a year’s time. So how much of a bother is it to measure what we eat? Not much, really. A “kitchen shotglass” includes measurements for teaspoons up to one ounce (got mine at the aforementioned Wally-World). A set of measuring cups and an inexpensive kitchen scale will help avoid over-estimating other serving sizes, as well. If you decide to do this “study”, I’d be interested in hearing about some things you learned. You can leave me a comment in the section below.